^ "The Ahmadi Muslim Community". The Times. 27 May 2008. ^ "Introduction to the Ahmadiyya Muslim Community". Retrieved 19 February 2016. ^ "Major Branches of Religions". Adherents.com. 28 October 2005. Archived from the original on 15 March 2015. Retrieved 19 April2015. ^ Herman L. Beck (2009). “The rupture between the Muhammadiyah and the Ahmadiyya” (PDF). Journal of the Humanities and Social Sciences of Southeast Asia (BRILL) (161): 219. https://brill.com/view/journals/bki/161/2/article-p210_2.xml. 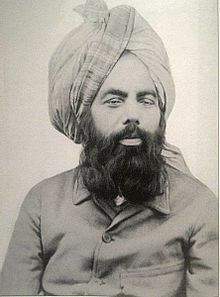 ^ Mirza Ghulam Ahmad: Tabligh-i-Risalat, Vol. IX, pp.90–91; Maulana Murtaza Khan: The Name Ahmadiyya and Its Necessity, 1945. ^ Falahud Din Shams:"Introduction to the Ahmadiyya Muslim Community"
^ A.R. Dard. Life of Ahmad (PDF). Islami International Publications. p. XV. Retrieved 3 September 2014. ^ a b 沼尻正之. “越境する世界宗教 ─グローバル化時代の神々のゆくえ─”. 追手門学院大学社会学部紀要 2010年3月29日 (追手門学院大学) 第4号: pp.57 - 72. http://ci.nii.ac.jp/els/contentscinii_20170606220551.pdf?id=ART0009487185 2017年6月6日閲覧。.